A larger than life-size statue of the emperor Hadrian, of which this head is the only part remaining, once stood in Roman London, probably in or near a public space such as the forum where it could be seen by everyone. If it was associated with the worship of the emperor as a god, it may have been in or near a temple. As the head was found in the Thames, there is also the possibility that it stood very visibly on the bridge that the Romans had constructed over the river. The image of the emperor and information about his achievements were spread primarily through coinage, but large official portraits had an important role to play. Statues and busts, in stone and bronze and occasionally even precious metal, were placed in a variety of official and public settings. They varied in size from colossal to life-size and symbolised the power of the state and the essential unity of the Roman Empire. As such, the image of the emperor was also a symbolic focus for attacks on Roman rule. The temple dedicated to the emperor Claudius in Colchester was burned down by Boudica and a bronze statue of Augustus in southern Egypt was destroyed by Nubian enemies and its head carried off to their home city. Imperial portraits could have other impacts. The physical appearance of the emperor and his family could influence fashion. Hadrian was the first Roman emperor to wear a beard and made beards popular throughout the Roman Empire. The hairstyles of empresses and other imperial women may be identified in private portraiture and decorative art, even in remote provinces such as Britain. Hadrian’s family was from Italica in Spain and he inherited control of the Roman Empire from his adopted father Trajan in AD 117. Trajan’s military campaigns had stretched Roman resources and rebellions had to be put down in several provinces. Hadrian made it his priority to establish limits to territory that Rome could control. Not content simply to make policy from a distance, Hadrian traveled extensively through the empire, strengthening government of the provinces and defining its borders. Under Hadrian, the frontier of the empire in Germany was marked with a wooden palisade fence and a string of forts, in north Africa and Arabia with forts and earthworks and, of course, in Britain with a stone wall. These installations enabled the Roman border garrisons to keep aware of potential danger and to control an area on either side of the frontier. Some experts think that Hadrian’s Wall and the other barriers were as much economic as they were military, intended less to keep enemies out than to control and derive benefit, such as taxes, from the movement of people, livestock and goods from one side of the frontier to the other. Whatever their practical purpose, they must have been clear indicators of Rome’s power and sophistication. Hadrian’s tours of his empire also gave rise to programmes of rebuilding and beautification of cities. He visited Britain in AD 122 and it is quite possible that the statue from which this head comes was erected to commemorate that visit. 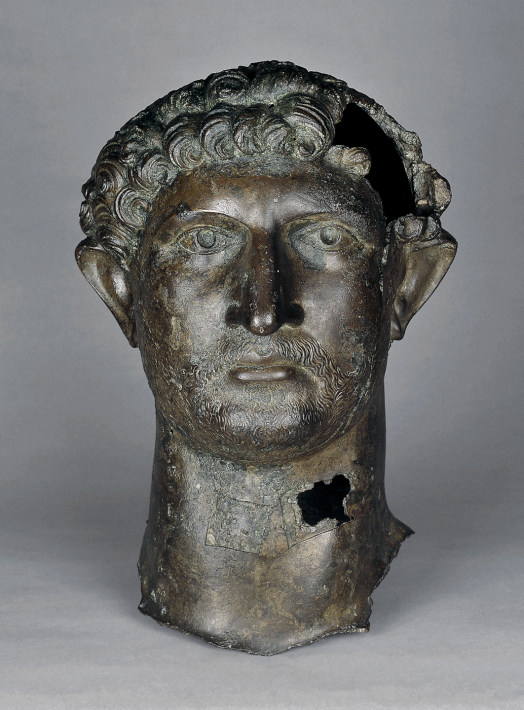 Information about the bronze head of Hadrian. Further information about Hadrian’s Wall from the BBC, with images. A timeline of Roman emperors. An article from the BBC about propaganda in the Roman Empire. Basic introductions to Hadrian and five other Roman emperors from the BBC. Information from the Portable Antiquities Scheme to help you work out some of the writing on Roman coins. Information from the Portable Antiquities Scheme to help decipher the Latin inscriptions on Roman coins.